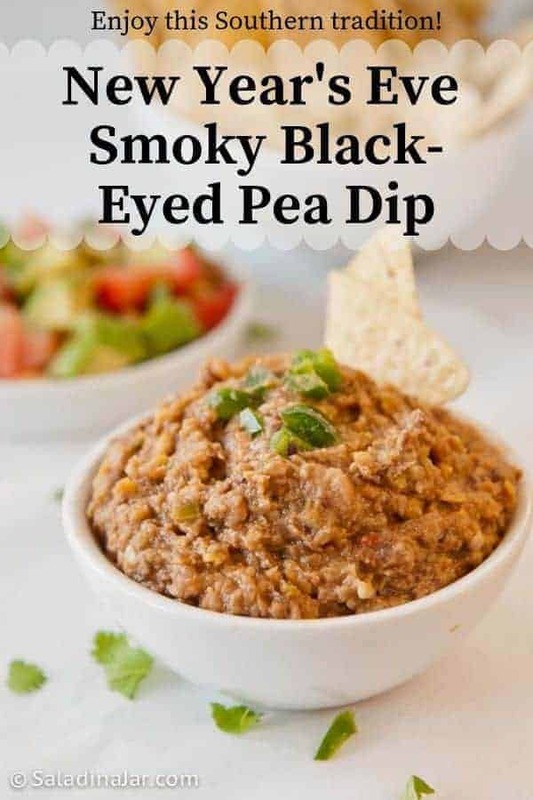 New Year’s Day Smoky Black-Eyed Pea Dip is composed of mashed (canned) black-eyed peas seasoned with smoky chipotle spice. Serve with chips. Finding a dime in your food is not normally a cause for celebration. But on New Year’s Day, it’s different. Small children and grown men have eaten way more black-eyed peas than they really wanted in hopes of finding the dime. Tradition says it brings good luck. My personal experience is that prayer is much more effective. 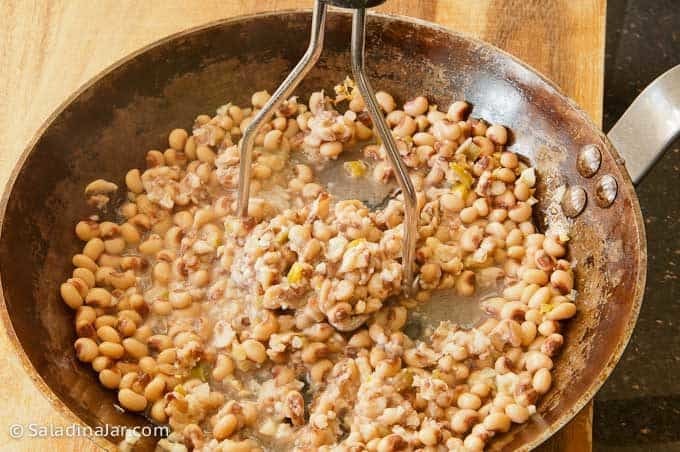 However, this southern tradition adds to the fun and gives us an excuse to fix black-eyed peas every year. By we, I mean our friends Joan and Steve and their family, with whom we enjoy sharing dinner on January 1st. 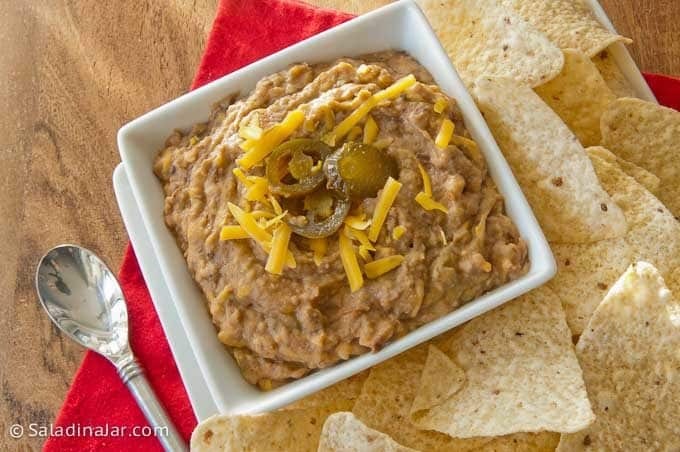 Chipotle powder gives this dip a smoky taste and aroma. Feel free to adjust the seasoning and amount of peppers according to your tolerance for spiciness. Fry onions and garlic until softened. 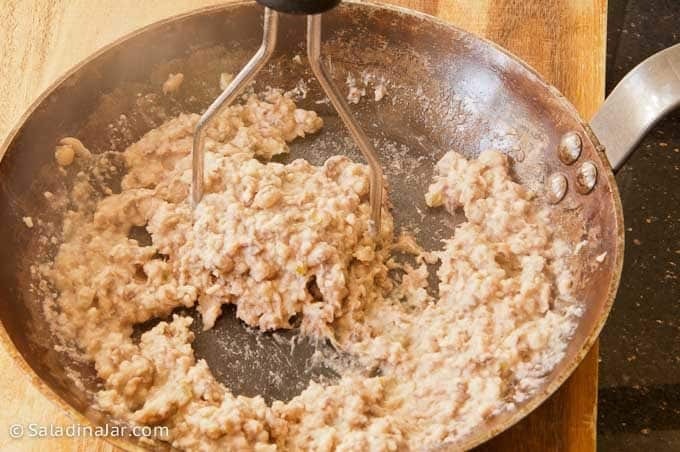 Use a potato masher to mash black-eyed peas. Continue mashing until slightly chunky. 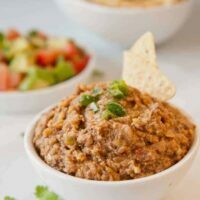 Doesn’t this look like bean dip made with refried beans? It tastes a lot like it. For that matter, black-eyed peas taste more like beans than peas to me. Turns out, they really are beans, also known as cowpeas. You can read a lot more about black-eyed peas here. 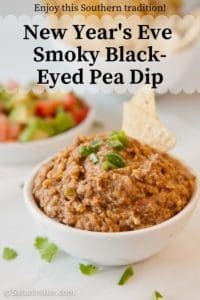 New Year's Day Smoky Black-Eyed Pea Dip is composed of mashed (canned) black-eyed peas seasoned with smoky chipotle spice. Serve with chips. Drain blackeyed peas, reserving liquid. 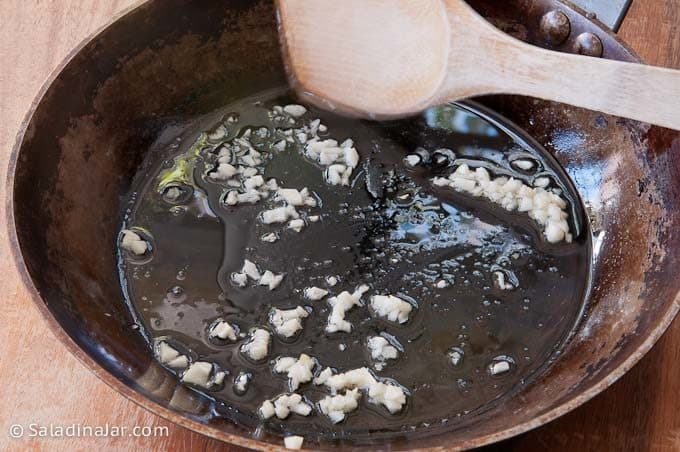 Saute garlic in oil in medium skillet over medium heat. 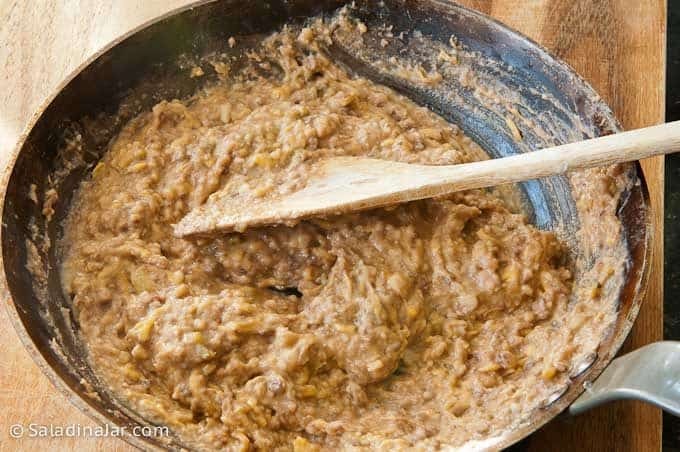 Add blackeyed peas and mash with a fork. Then add reserved liquid from peas. 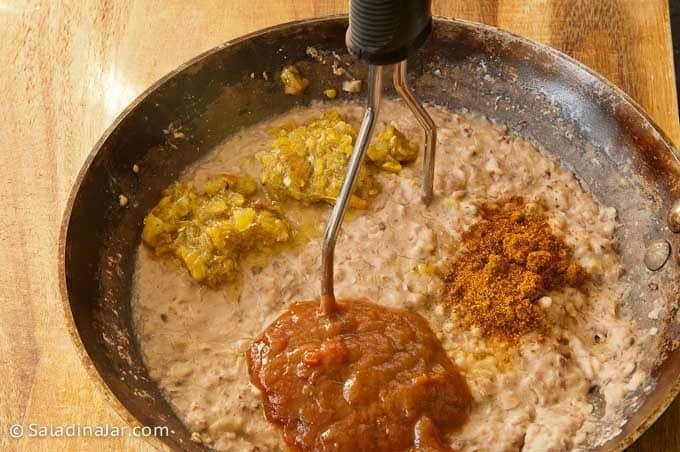 Add chipotle powder, hot sauce to taste (a couple of drops is all I need since I'm not a native Texan), salsa (your choice of heat and flavor), green chilies and salt. 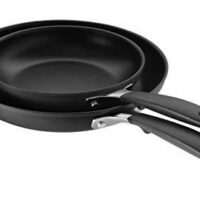 Combine and continue to heat thoroughly. Add cheese (plenty, according to my husband, who IS a native Texan) and stir to melt just before serving. Serve with tortilla chips. I also like to eat them "burrito-style". I recently discovered uncooked Roti-Chapati at Costco. 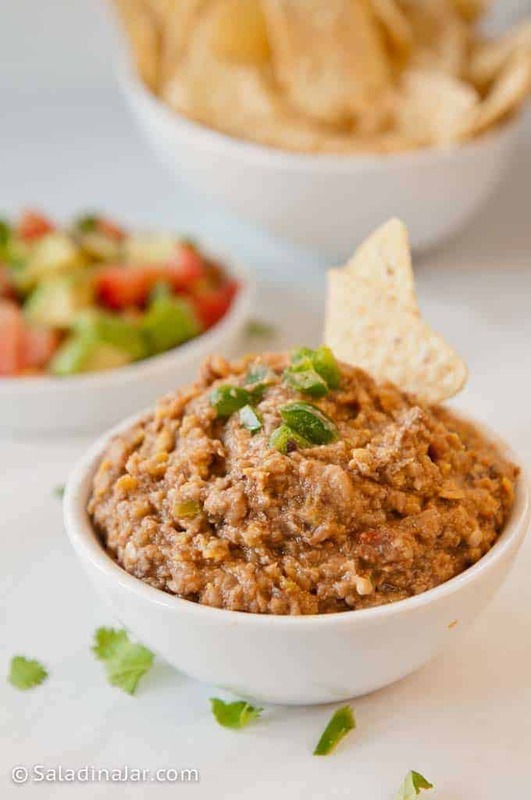 They taste and behave exactly like whole wheat tortillas and go just great with this dip. Thanks for this recipe. I’m not a big fan of blackeyed peas but my family believes in the New Years Day tradition – so this how I’m going to start off the year from now on! This looks delicious! Hoping to get a chance to try some soon. To answer your question, the can in my cupboard has blackeye peas. So I’m thinking it’s one word? I didn’t learn about the black eyed pea connection to New Year’s until last year. This looks awesome! Hope that you had a wonderful Chirstmas. The dip looks delicious.